I love Auckland more each day. The city is alive now in a way it has never been before, even as little as five or even two years ago. I guess the Rugby World Cup brought about the biggest changes. Even though I mocked the tram on its tiny loop in Wynyard Quarter, I have total respect for the work that has been done on North Wharf. Go on a Friday night, when the Silo Market is on, along with a free open-air cinema session, and you will know what I mean. Friday night Silo Park Market. Then there are the changes in Federal Street, including the ever-popular Depot eatery, and the exciting little shops in Ponsonby Central. The Auckland Night Market is expanding beyond the Pakuranga Saturday market and Glenfield Sunday market to include Friday nights at Hunter's Plaza in Papatoetoe and Thursday nights in Onehunga now too! The Britomart area, which had once been "those dilapidated buildings opposite Showgirls with graffiti and broken windows", is now a pleasant place to be, both for the ambiance and the food options available. Even the cheap Chinese eateries on Dominion Road have stepped up, with brand new signage highlighting their names in illuminated, colour-changing glory. And there are promises of even more good things to come. The City Works Depot has been revamped, and by the end of the year we will see a new Al Brown restaurant there, as well as Michael van de Elzen's Foodtruck Garage (I saw his Food Truck parked there already). There is a beautiful complex being built in Osborne Lane, Newmarket, with brickwork buildings and paved walkways, where I hope to see more great eateries. One of the brightest jewels in our city's crown, of which all Aucklanders should be proud, is the new(-ish) Auckland Art Gallery on Lorne Street. And in this magnificent building, I will have you know, is one of the best cafes in Auckland, which, for some unknown reason, seems to have garnered some poor reviews, including in the Herald (never mind that the writers complain about the temperature of the coffee or the length of the queue rather than having anything concrete to say about the quality of the dishes offered). The cafe is on the next floor up, behind the floating flowers. The cafe is officially on the first floor of the art gallery, but you actually have to walk up two flights of steps from the main entrance, because there is an intervening floor called the Mezzanine. That's the one where you have a superb view of the floating flowers that open and close, which you can even see from outside the museum. Run by Dawsons Catering, the cafe changes its menu regularly, and also offers a special menu which is themed along the lines of the special exhibit which is running at the gallery. For instance, for the Home AKL exhibit on Polynesian art last year, the special menu included a Samoan banquet fold over, ota ika raw fish salad, Fijian chicken curry, coconut rice pudding, and an "island passion" dessert with pineapple mousse, passionfruit gel, coconut dacquoise, and mango salsa. The main menu gets updated too. We were impressed to find the old-fashioned dish of lamb's fry (liver) on the menu last year, served with a potato rosti that looked like a glorious, deep-fried slice of cake. That is no longer available, but other tempting menu items have taken its place. Lambs fry, bacon, shallots, jus, potato rosti & watercress pesto. A highlight of the current menu is the soufflé, which had a strong smokey note, and went well with the bitterness of the radicchio and the sweetness of the roast pear pieces. The toasted hazelnuts boosted the flavour of the dish too, and it was more filling than it looked. Soufflé twice baked, Mt Kyeburn smoked cheddar with radicchio, roast pear & hazelnut salad (partially eaten). Although we have an aversion to sweet breakfasts, the banana walnut eggy bread (which we would have called "French toast") was also enjoyable, if somewhat less exciting. Banana walnut eggy bread with maple syrup, strawberry compote, cinnamon mascarpone and free range bacon. We have not yet tried the other items on the menu, but we liked the mix of traditional cafe breakfast dishes and a range of other choices. There are also counter options available, with the usual sandwiches, muffins and sweet treats, as well as salads. With their great selection of delicious and beautifully presented dishes, and a modern airy environment, including seating on the deck overlooking the front entrance, what's not to like about the Auckland Art Gallery Cafe? Oh, and did I mention that they only use free range eggs and bacon? The cafe does not take reservations. We prefer the more lunchy items to the more breakfasty items here. You can have the soufflé too, though no doubt the other dishes are also tasty. The Green Vegetable Soup ($13.50) was under-seasoned though, when I tried it. 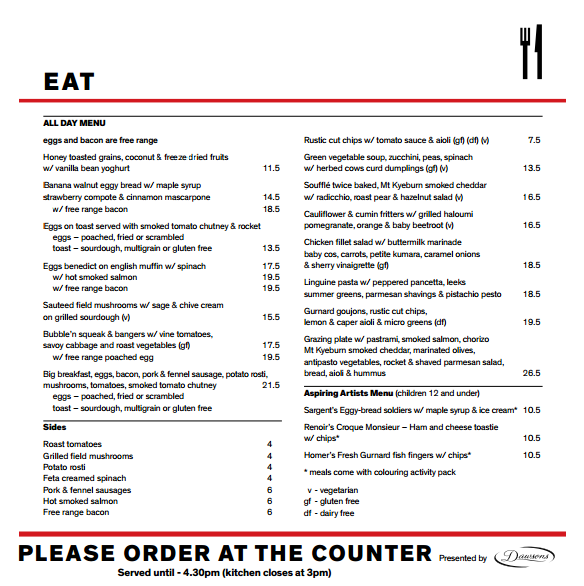 Vegetarian, gluten free and dairy free items are clearly marked on the menu. Auckland Art Gallery from the outside. Thanks for the reminder that there is a cafe at the Art Gallery, looks like a great place to bring my parents next time they're in town. The menu is interesting and I really like the look of that eggy banana and walnut bread.